Home > Physical Development 0-3 > What do Babies Hear? When a baby is born his/her auditory system is the most strongly developed of all the sensory systems. This means that in general babies respond to the world first through their hearing before all of their other senses. Many parents are surprised that hearing is more developed than sight in newborns, but in the first year of life the two sensory systems develop so that toddlers begin to explore their worlds with both of these systems almost fully developed. Some children, however, are born with limited or no hearing, so if parents or caregivers begin to worry about their children’s hearing then they should consult a GP immediately. Newborn babies can hear almost as well as adults fairly soon after their birth. A few slight impediments may exist, such as that many infants are born with fluid in their middle ear which obscures hearing slightly, and often the other ear “equipment” that is used for hearing is slightly underdeveloped in infants. This, however, is natural and develops as the baby grows. Parents may notice these slight challenges to hearing as infants generally respond more frequently to very high pitched or overly loud sounds, such as exaggerated human voices. Parents may also notice that a baby seems to respond well and distinguish their own voices – particularly the voice of the mother – from others, which many believe is a result of hearing these parental voices while in the womb. While there are methods of screening newborns for hearing loss, some babies are still not tested after birth so parents will need to observe their child and contact their GP if they become concerned about their child’s hearing. Infants will generally have a startled reaction to loud sounds and turn towards a voice in the first few weeks and months of life, so these are clues that parents should look out for if they worry about their child’s hearing. A variety of causes may contribute to hearing difficulties in children, so testing, diagnosing and treating these difficulties immediately is in everyone’s best interest. Over 800 children are born with significant deafness each year in the UK. If a child does suffer from hearing loss, a GP will best recommend a course of action or put families in touch with hearing specialists. Sometimes deafness and hearing difficulties are treated with hearing aids while in other cases they may be treated with surgery or simply waiting as the child grows. For children with significant hearing loss, learning to lip read and use British Sign Language may be suggested for communication. Unless an infant suffers from hearing difficulties or deafness, (s)he will be born with hearing that rivals an adults’ in just a short while. 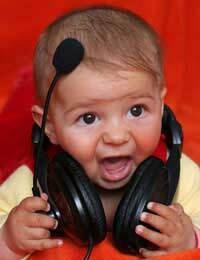 Not only will infants hear noises and voices, but be able to distinguish pitches and tones as well. Speaking to babies in reassuring tones, playing soothing music and singing gentle songs will all help children develop their hearing and later language skills. If infants do not react to voices or noises, parents should contact their GP to discuss the possibilities of hearing difficulties. Testing for hearing loss is not difficult, and the sooner a baby is diagnosed with hearing loss or deafness the sooner treatment can begin.